If you die in SL...: Introductions - Why SL? My mother would kill me if I went out with that much skin on show! So here is the virtual me - a pale redhead that I unwittingly called "Kitti" (if I'd thought it through, I'd have steered clear of the name) Wytchwood. 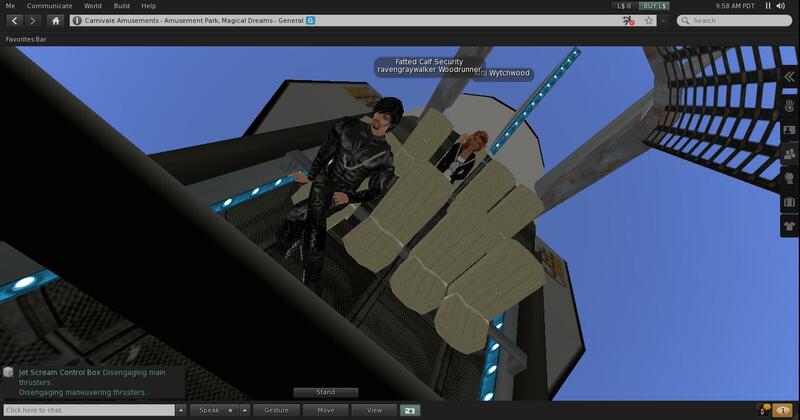 I signed up for Second Life and downloaded the viewer in October/November last year (2010) and off I went into the land of spaceships and bite requests, whatever the Hell they are. As avatars go, I don't think I look too bad. I have been asked several times by other SL users if this was my "alt" - an alternative character, as opposed to a "main" character, as I don't "look like a newbie". What does a newbie look like, I hear you ask? Well, I'm afraid that I'm perhaps still too new to be able to answer that, but I know that one of the first things my friends helped me do when I logged into SL was lose the default duck-waddle walk I had been assigned, and send me some hair that did not look like it had been painted onto my scalp. Maybe the fact that I now walk like a supermodel and have hair that waves around in non-existent breezes means I have been accepted into the fold as it were. 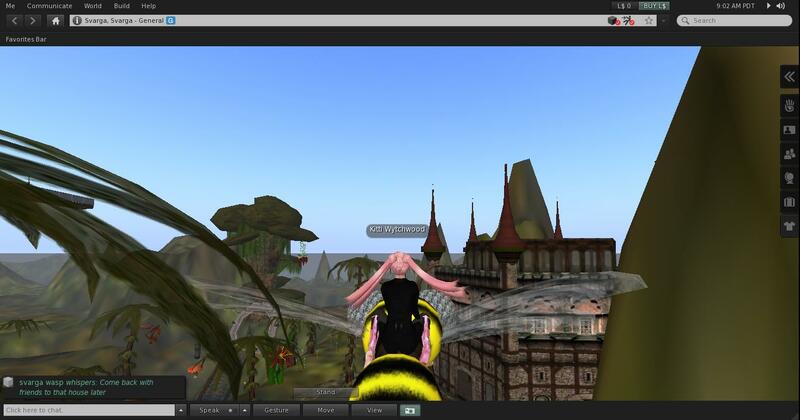 Upon logging into Second Life for the first time, you are put through perhaps the most useless tutorial ever, and then dumped into a pretty random place called "Welcome Island" that serves only to teach you that somebody at Linden Labs has a fantasy about being able to ride bees. I kid you not - a giant bee will give you a very boring tour of the island, and when you are done, you'll wonder why you bothered signing up at all. Please don't mention the hair. The only way, at least that I am aware of, to get off the island is to teleport - which requires you to be familiar with the Destination Guide and the teleportation system that the tutorial utterly fails to tell you how to use. It also fails to inform you of how to access the library of skins, hairstyles and outfits in your inventory so that you can dress yourself. Many of my classmates gave up trying to find things (though it's not actually that difficult) and decided to be bald. Well, whatever works for you, my friend. But to return to that all-important question: why bother using SL? In an article I read when researching for my essay about finding love on Second Life, the author Marion Cox says that when his friend suggested that he turned to the virtual world, he felt that he was ‘"possibly insinuating that I was a giant failure in real life". It would appear that this is a general consensus amongst those who don’t like or don’t understand Second Life – that you must have failed miserably at life in general and thus need a place to begin again. For some people, Second Life offers a chance to try again, but for others it is merely an extension of the Real World, simply something else to ‘give a go’. It is a form of escapism, offering another world for your exploration on a rainy afternoon when you’re feeling particularly poor. But what you are expect from Second Life will undoubtedly shape what you get out of it, and reflecting upon yourself to understand your expectations gives you clues as to what you want to do within the virtual world. In my experience, if you want nothing out of it, you’ll probably find nothing to do within it - though I would suggest that a rollercoaster ride in SL doesn't quite get your adrenalin going like being on Oblivion at Alton Towers. A new venture for adrenalin-junkies? I think not. As said in the previous post, I signed up to SL because my lecturer advised us too, saying that it was the only way we could really begin to understand the topic in hand. I entered the realm in the mode of ethnographer, I suppose, wanting to see and understand and document, but at the same time staying somewhat detached. I was not expecting to get much out of SL other than understanding, and thus had little emotional attachment. I wanted to see what SL had to offer, and I have undoubtedly been treated to some odd sights. Labels: avatars, tutorial, why sl? Aha I found you! not through my blog though - couldn't do it that way..thank goodness you posted the link on fb otherwise I would never have found you.